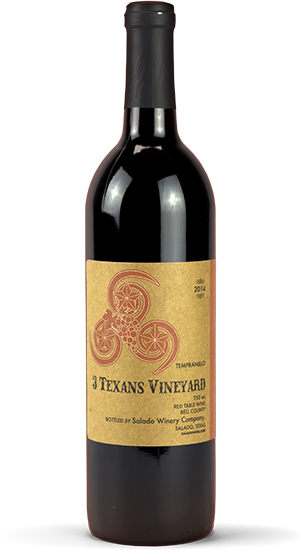 At Salado Winery Company, all of our wines are produced from grapes sourced around the state of Texas, most of them from right here in Bell County. We now offer Gift Certificates for our online store! Click the button below to purchase for yourself, or as a gift for a friend! As winemaker, my job is like that of a chef. I am focused on using locally-grown grapes, as well as, presenting wine drinkers with wines that taste great. 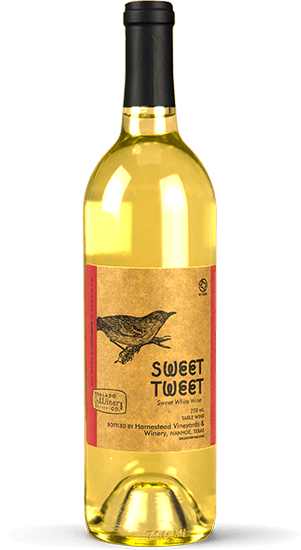 Sweet Tweet is also a partnership project with our friends at Homestead Winery. Muscato or Muscat, we don’t care what you call it! This muscat canelli has a floral aroma, citrus after taste. We’ve sold over 475 cases since March 2007. Our 2012-2013 vintage was one of the most popular, as it was a dual-year vintage and featured a triple blend of all three of our red grapes from the vineyard – Cabernet Sauvignon, Merlot, and Sangiovese. 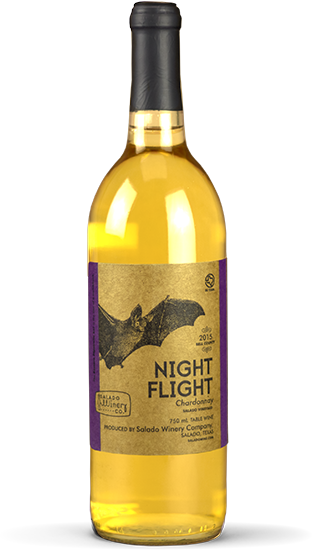 Night Flight is our first dry white produced on the premise. The 2015 batch, our current vintage, is 100% unoaked Chardonnay from our vineyard in Salado. It’s quite tart and dry, but refreshing on a hot summer day. 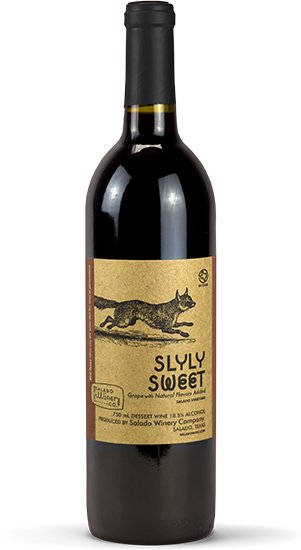 Our newest chocolate dessert wine! These Black Spanish grapes were picked in Belton in 2012. 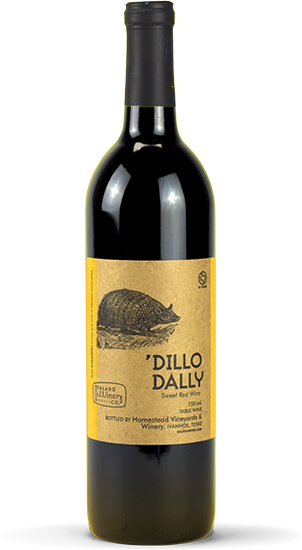 This terrific sweet red wine is specially made for us by our friends at Homestead Winery in Ivanhoe, Texas. It is hand-crafted to our picky specifications. 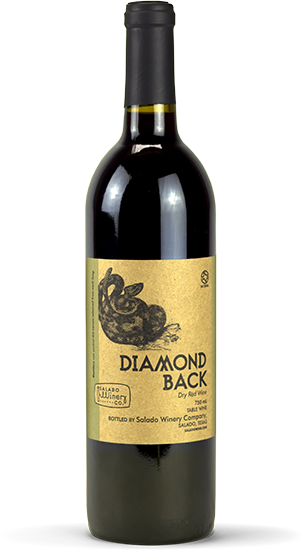 Since March 2007, we’ve sold over 750 cases of this wine! The first wine made on the premise from grapes from our Salado vineyard. This is a sweet red wine made from Sangiovese. The first vintage was made in 2010 and it was released in August 2011. The 2011 vintage was sold starting August 2012 and was small due to the drought of 2011. 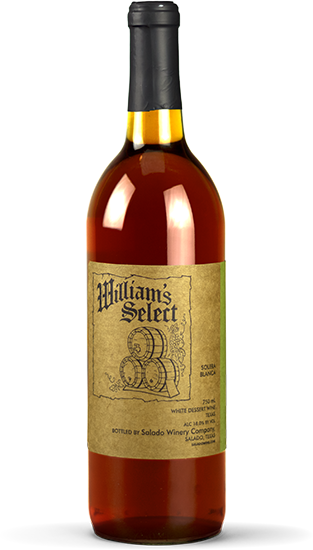 The 2012 vintage was released in February 2013, but it wasn’t sweet enough, so in August 2014 we combined the 2012 vintage with the 2013 vintage and sold the last bottle in May 2014. 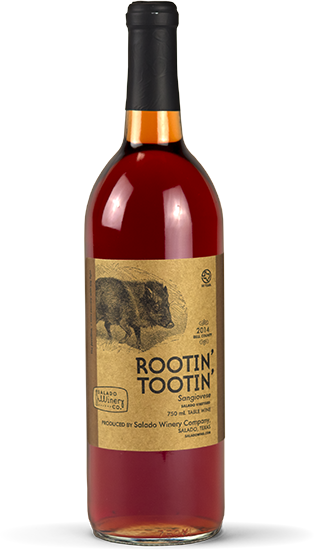 The 2014 vintage was released in August 2015 and is the sweetest, most popular Rootin’ Tootin’ yet. We are especially proud of this year’s label as it features the vineyard name, vintage date 2014 and Bell County as the location! Tempranillo is the #1 grape in Texas for a reason! 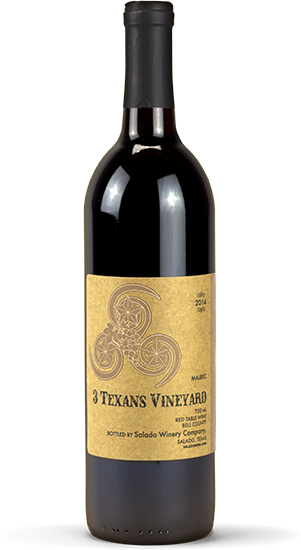 This Tempranillo, grown by 3 Texans Vineyard in Temple, TX, is one of our favorites. 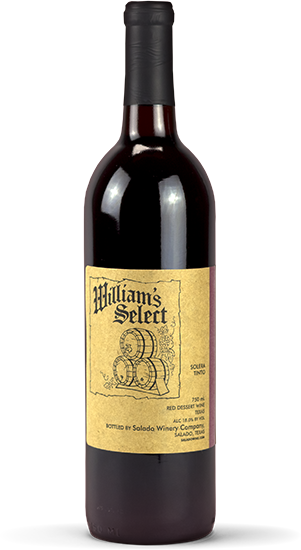 It is completely fermented, aged in 100% medium toast French oak and then bottled here at our winery. Grown by 3 Texans Vineyard in Temple, TX. 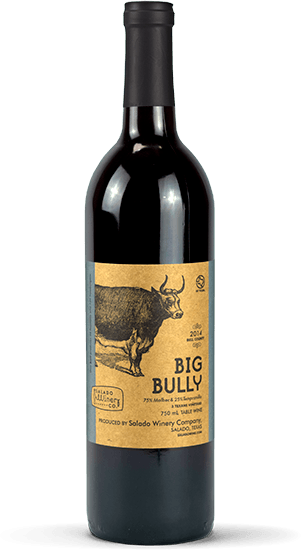 If you like Big Bully but want to try a version without the kick of Tempranillo, try this wine! Aged in 100% medium toast American oak. 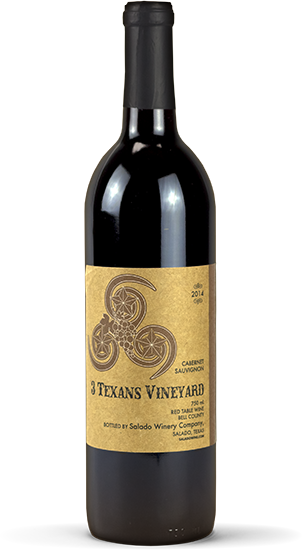 Grown by 3 Texans Vineyard in Temple, TX, this is a wonderfully oaky Cabernet Sauvignon. We splurged on heavy toast French oak for this wine! It’s perfect with heavy pasta dishes and wood-fired pizza. Our most labor-intensive wine. Everyone on our team loves this wine! This is our sherry-style white dessert wine, aged solera style in partnership with our friend Bill. It’s wonderful in cold weather with simple shortbread cookies while curled up by a fire! Our port-style wine, aged solera style since we opened back in 2005! This is a partnership with a longtime friend named Bill, so we named it after him! This 18% wine is perfect with dark chocolate. Did I tell you how much we love wine? We started out selling other folks wines in 2005 and we have enjoyed that so much we still sell them. Every year in March we host the Texas Wine & Rogue Art Fest so we can share our favorite wines. We love it! We make it! We drink it! We bathe in it! Ok, now we’re exaggerating. Call us at 254-947-8011 to see if we have your favorite on hand.